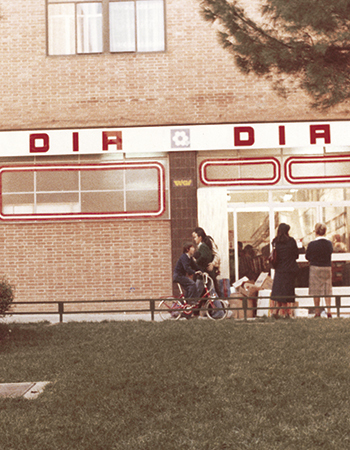 The DIA Group is a Spanish multinational that was created in 1979 with the opening of its first store in the Saconia neighbourhood of Madrid. The company presented a new concept: ‘hard discount’ stores, where the main priority was value for money. Only five years later, in 1984, the company surprised the market with one of the milestones that marked its future development and brand image: the commercialisation of own-brand products, which at the time was an entirely unknown model in the Spanish market, with an entirely white design with (for the first time) the red DIA band which has appeared on the company’s packaging ever since. At the end of that decade, the company’s business posted strong growth also thanks to the decision to offer individual entrepreneurs the opportunity to become entrepreneurs of a brand, and thus the company began to develop its current franchise model; franchises currently account for almost half of the company’s worldwide store network. In 1993, the company initiated its internationalisation process, with the opening of the first stores in Portugal where it operated under the Minipreço banner. It subsequently entered other countries, consolidating its significant current presence in Latin America through Brazil and Argentina. At the same time as it was progressing with its expansion, the DIA Group was also developing its commercial offer, with the launch of Club DIA in Spain in 1998. This was the first loyalty programme in the large retail sector in the Spanish market, allowing customers to obtain discounts and lower prices immediately from their very first purchase, by means of an associated card. Currently, more than 40 million customers are members of Club DIA, and purchases associated with this card account for 70% of all purchases made at DIA. In 1999, the company was integrated into the French group, Carrefour. This transaction brought together both companies until 2011, when DIA was spun off. On 5 July 2011, DIA was listed on the Madrid Stock Exchange at a price of EUR3.5 per share, and on 2 January 2012, the company joined the IBEX 35. With the acquisition of the German chain Schlecker in Spain and Portugal (which led to the creation of Clarel), DIA took a step towards becoming a multi-brand and multi-format company, which was strengthened with the acquisition of El Árbol in 2014 and of 144 stores from the Eroski Group in 2015. These latter acquisitions led to the development of a new store model, La Plaza de DIA, a proximity supermarket whose main difference is that it has meat, delicatessen, and fish areas managed by specialised staff, as well as a wider assortment of fruit, vegetables, and bread. 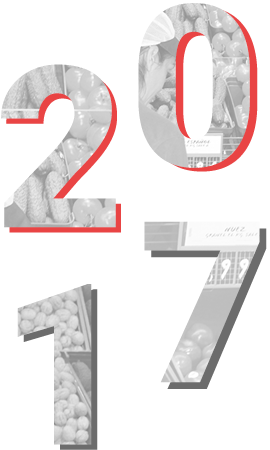 The company’s organic growth in recent years has been accompanied by a gradual digital transformation process and the opening of new online sales channels initiated at the end of 2012, which has allowed the company to expand its services, making its proximity offer even more complete, combining its extensive network of physical stores with the online channel and positioning itself as a key player in what will be the shopping environment of the future. In addition to this expansion and shift in its model, in recent years the company has developed a policy of partnerships with third parties, aiming to offer more and better services to its customers. Proof of this can be seen in the company’s partnerships with Amazon, IGN, and Samsung. In terms of its relationship with suppliers and always striving to secure the best competitive outcome, DIA has signed commercial agreements with other market operators such as Eroski in Spain, Intermarché in Portugal, and the recent signing of an agreement with Casino in France.